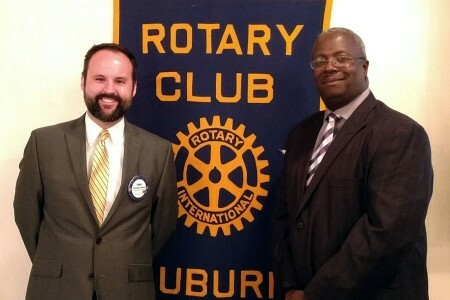 Al Davis (right), director of workforce development at Southern Union State Community College, spoke to Auburn Rotarians on Wednesday, Aug. 30. Davis discussed the workforce skill gap in Alabama and our region. He also shared information on various certificates and degrees individuals may attain at Southern Union, which lead to employment in area industries. Pictured with Davis is Club President Chris Warren. The Auburn Rotary Club meets each Wednesday from noon to 1 p.m. at Saugahatchee Country Club. For more information about the Auburn Rotary Club or how to become a member, visit www.auburnrotaryclub.com.